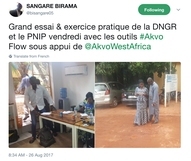 Acting as a online expert in West Africa, supporting partners in the elaboration and maintenance of the online Akvo tools. Visiting West African partners to give support and training on Akvo FLOW, websites, GIS and web mapping. Since 2008 I worked in different roles as an online specialist for international organizations like UNICEF, Textcase and AfricaRice. From 2010 until 2012 I worked freelance in Benin. Beside developing online platforms, I supported and trained organizations in West Africa to reach their online achievements.